Rockwell Hardness Testing Machine we offer is manufactured in conformity to IS: 3804-1988, BS: 891 parts 1&2, ASTM:E18 for Rockwell Test, IS: 2281-1983, BS: 240, ASTM:E10 for rockwell Test & IS: 5073-1988, ASTM:E 18 for Rockwell Superficial Test. 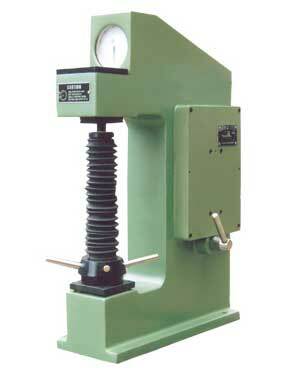 The Hardness Testing Machines we offer are simple in design & easy to operate & dimensionally accurate. Model Unit Seras Serasm SE RAB-1 SE RAB-250 SETWIN Loads Kgf. 60,100 60,100 60,100, 150 60, 100,150 15, 30,45, (Rockwell) 150. 150. 187.5, 250. 187.5, 250. Superficial) 60,100,150 (Rockwell) Initial Load Kgf. 10 10 10 10 3(Rockwell Superficial) & 10 (Rockwell) Max. Test Height mm. 230 230 230 295 295 Depth of Throat mm. 133 133 133 150 150 Max. Depth of elevating mm. 240 240 240 310 310 Screw below base Size of Base (Approx) mm. 171x423 171x423 171x423 210x470 210x470 Machine Height mm. 635 635 635 845 845 Net. Weight (Approx) Kg. 75Kg. 75Kg. 75Kg. 137 Kg 126 Kg. Net. Weight (Approx) Kg. 75Kg. 75Kg. 75Kg. 137 Kg 126 Kg.